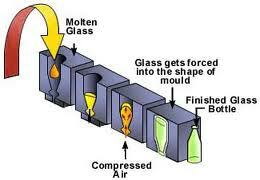 One of the longest established occupations within the glass industry. Until the second half of the 19th century bottles were made by hand gathering, blowing and finishing the neck. 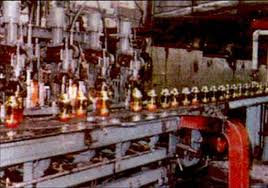 By 1887 glass making developed from traditional mouth blowing to a semi-automatic process when Ashley introduced a machine capable of producing 200 bottles per hour in Castleford, Yorkshire - more than three times quicker than the previous production methods. Twenty years later, in 1907, the first fully automated machine was developed in America by Michael Owens from major glass manufacturers Owens of Illinois, and used at its factory in Manchester, Illinois making 2,500 bottles per hour. Today, glass making is a modern, hi-tech industry operating in a fiercely competitive global market where quality, design and service levels are critical to maintaining market share. Modern glass plants are capable of making millions of glass containers a day in many different colours, shapes and sizes. The complexity of the manufacturing processes, new equipment, customer demands and the ever present need for Health and Safety procedures to be observed has made the need for qualified, competent Operators more important than ever. The current GQA Level 2 Glass Container Manufacturing qualification was updated in 2010 to take account of changes in the Industry.